From 'Road to Arkham', through the Arkham City mini-series, digital exclusives and 'Arkham Unhinged', discuss the Arkhamverse EU here. 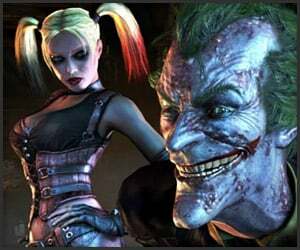 This special, epic story follows events from the conclusion of the Arkham City video game and leads into the much-anticipated Harley Quinn DLC (downloadable content). Batman's greatest foe is dead, but why is the Dark Knight so troubled? Past and present conflicts are explored in this six-chapter weekly series. Immediately after the death of Joker, the news rips through both Arkham City and Gotham. Arkham City erupts in violence, headed up by the grief-crazed Harley Quinn. The police try to take control of the situation, while Batman finds a post-mortem message from the Joker himself! Batman learns the full extent of Joker's horrific plans for revenge. Even from beyond the grave, Joker's diabolical plotting causes a full-scale riot--both in Gotham and in Arkham City. A final clue sends Batman rushing to Arkham Asylum to try and save the city, but will he get there in time? hen Batman arrives at Arkham Asylum to follow up on a clue, it forces him to remember an early encounter with the Joker, one that tied in to a terrifying attack on the citizens of Gotham. What connection does this past episode have to the arch criminal's current plot from beyond the grave? Batman is deep inside the ruined Arkham Asylum, searching for a clue to disarm Joker's final, deadly plot. He finds himself in a cell steeped in the history of the war between these two men--the very cell used to hold Joker all those years ago. Could this cell also be the final resting place of Batman?! Final chapter. Arkham Asylum is in ruins, destroyed by the Joker's posthumous act of terror. The media and the Gotham police pour in, searching for Batman, only to find shreds of his uniform amidst the rubble. Has the Joker accomplished in death what he could not achieve in life? The paper version gets released November 14th this year. Is this any connection to Arkham Unhinged? Same writer. Unhinged took a 6 week break whilst this was published in its place. I loathe you. You have no manners, you're arrogant, and conceited, and I wrote you a letter about it, in fact. Well for those of you that were waiting to read this story in print form rather than digitally, your wait is over. The print issue of Batman: Arkham City - End Game #1 comes out today. Don't be fooled by the issue number itself, as they had to give it an issue number to begin with. But this is the entire 60-page story that was released as 6 ten page chapters digitally. Arkham Unhinged #8 with Killer Croc also comes out today in print as well. So for you Joker and Croc fans...this is your week! dfridolfs wrote: Well for those of you that were waiting to read this story in print form rather than digitally, your wait is over. I've got it reserved at my local CB store! Can't wait to read it. Last edited by jifw52 on Apr 5th, 2015, 6:39 am, edited 1 time in total. Read these all on Youtube recently, and was actually plesantly suprised. The artwork reminded me a lot of Serious House on a Serious Earth, which was a nice change to the usual comic book stylings. The writing, particularly for Batman himself, was very good and it has a good pace. If you like your Batman gothic, this is definetly for you. Check out my latest fanfic, Clipped Wings, here! Does anyone know if End Game will be included in the volume 2 of Arkham Unhinged? "Say hi to Joker for me." shadow wrote: Does anyone know if End Game will be included in the volume 2 of Arkham Unhinged? It's in the newly released Volume 3. Batman: Arkham Origins The Official Novelization. Read on "Our Arkhamverse" now! Caped Crusader wrote: Is it in continuity? With the introduction of the Arkham Knight comics I believe it only seems to serve now as an alternate ending to Arkham City.